As I previously mentioned, I have the living room painted (save for a bit of touch-up work. Here are the before and after pictures. I’m quite happy with the new paint job. It brightens up the room quite a lot and is so much more “us”. I’ll have to get a daylight photo sometime. 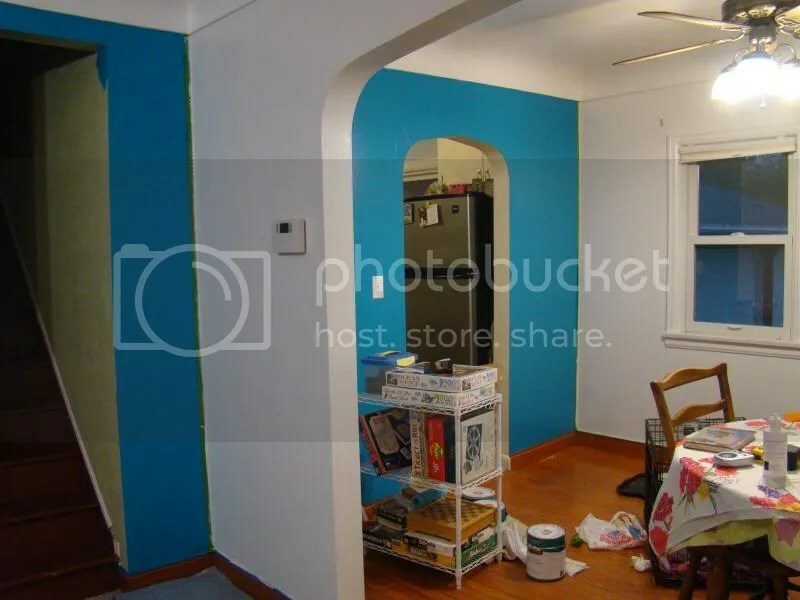 I painted the archway between the living room and dining room blue as well. Hubby thought it looked better white. I think it looks better blue. I’m still finishing up the painting in the “hallway” – I just have one more coat around a few edges and then we can put the trim back up. I still have some touch-up work to do in the living room and dining room and the window frames need a new coat of paint. The stairwell heading upstairs is still sage green and I’m going to paint it blue. The stairs are currently painted a brownish-maroon. I think I will paint the horizontal parts blue and the backs of the stairs white. At some point we plan to put a carpet runner on the stairs for some cushion. Last week’s project was painting the living room and dining room. 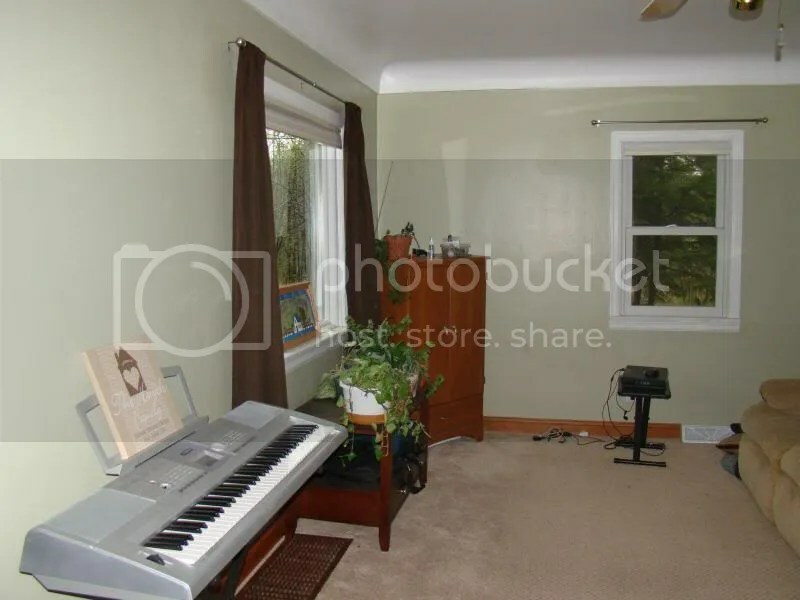 As you may have seen in other posts, the living room and dining room were all a dreary sage green and the living room had brown curtains. Drab and dull and not my speed. I wanted to brighten up the place and ultimately ended up decided to paint three walls in each room white (Glidden White on White) and the fourth wall Caribbean Blue (another Glidden color). 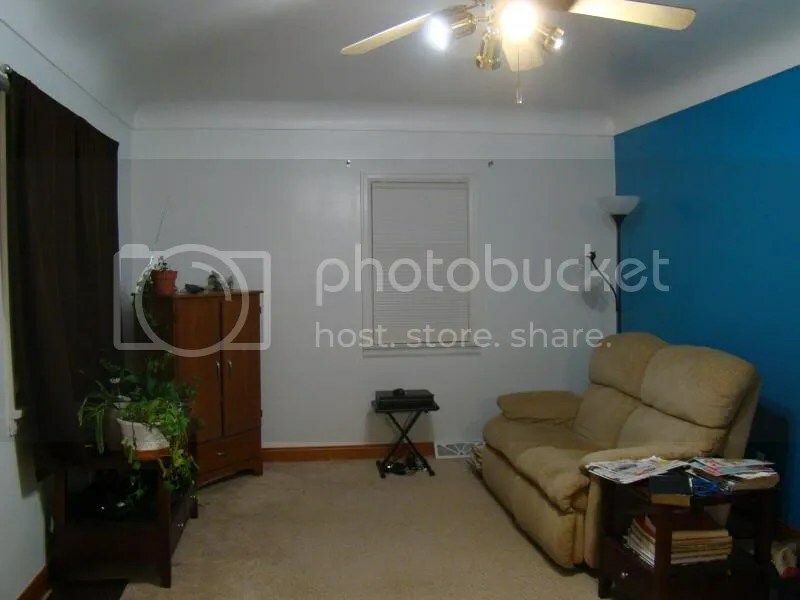 I wanted a bright color but the area just seemed too small to paint all the walls the bright blue and I didn’t want the entire room white. The area is much brighter now and I love the color choices! I still have a bit of touch-up work to do, the “hallway” downstairs needs another coat and some trim work, and the upstairs stairwell needs to be painted. The window trim in both rooms needs re-painting as well. 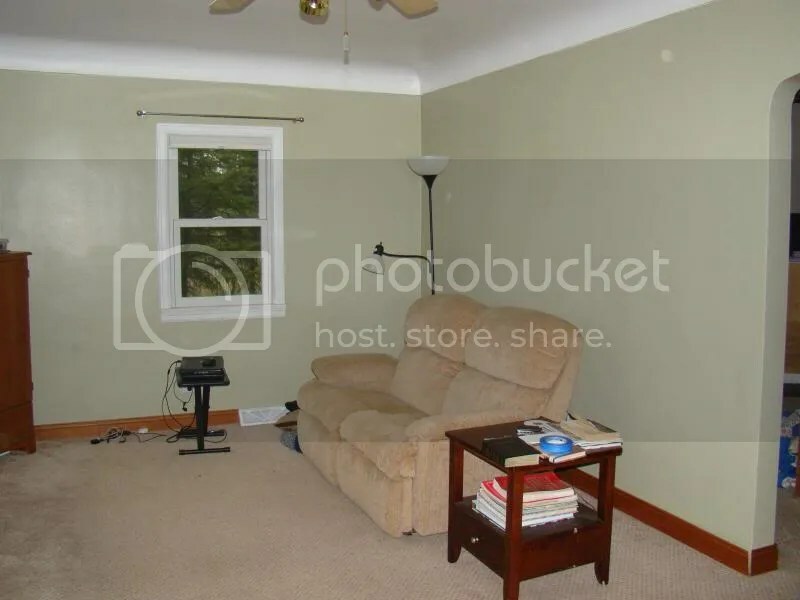 Other plans for the living room and dining room include getting new curtains (that aren’t brown), a new (at least to us) couch, and possibly other new furniture pieces if I find something that catches my eye. I have yet to have a sunny day where I’ve had a chance to take a good pictures of the new look so for now you’ll have to use your imagination. We’ve had an exceptionally rainy/wet spring here and we seem to average about one sunny and warm day followed by five rainy, cloudy, cold days. Once I have a sunny day and five minutes, I’ll take a few pictures and get them posted for you to see. Welcome! My name is Pam. Hubby and I bought our first house in April of 2013. I want to chronicle our life as homeowners, the things we learn, and the changes we make to the house. The house is a 3-bed 1-bath with detached 3-car garage, all on nearly 7.5 acres. It was built in 1944. This blog is updated as I complete projects and find time to post about them.